Instead of filling the maximum amount legally allowed, they sought to minimize site disturbance, utilizing a quarter of what their permit would have allowed. The only fill areas were those necessary to support automobile access, and even here they installed a system that maintained the subterranean flows of the wetland. The system was designed by the builder, who was selected for the project not only for his record of well-crafted houses, but also for his degree in botany and evident sensitivity toward and knowledge of the wetland context. So this was an owner, architect and builder team uniquely predisposed to working with, rather that against the site. This collaboration led to a design of the thinnest north-south massing, maximizing the buffer between the riparian areas to the west, and sensitive hystisol soils to the east, while capturing the extraordinary views. An east deck dips toward the wetland without touching, while a small “dock” cantilevers to the west and provides a place to sit near the creek waters. This orientation posed challenges for solar performance, addressed in the design by deeply recessed windows shaded from summer sun, and by extension of the “butterfly” roof along the west facade and a custom grillwork maximizing winter solar gain while limiting western summer sun. The massing and detailing of the home draws on vernacular forms of western agricultural building types, most notably the “stack” granary, and grain hopper. The custom cedar siding was milled to mimic 4x6’s, which while conventional in thickness on the surfaces, are detailed at corners and railings to show the full 4x6 profile, giving a solidity to the structure even as it hovers over its wetland piers. 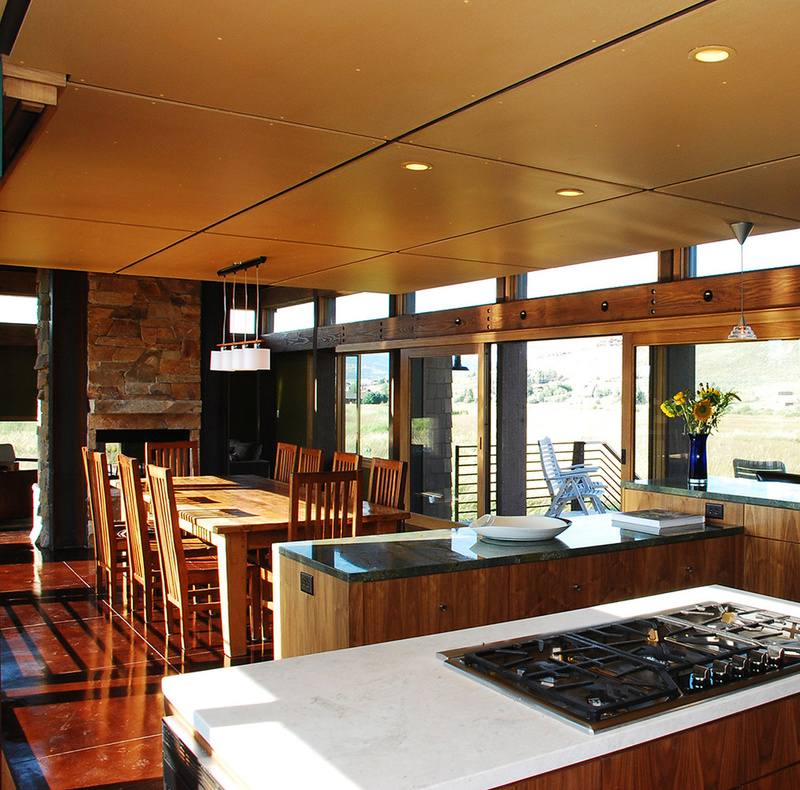 At the kitchen, a “wheat”-colored and hopper-shaped cement board ceiling lifts from the intimate kitchen/dining area toward the mountains from interior to exterior. A continuous clerestory ribbon of glass floats the hopper and second floor to create the appearance of a large cantilever extending from the grounded garage spaces over the glass sided dining area and the shingle-sided “duck blinds” of the kitchen and living areas of the main house and the owner’s office space in the guest house. With interior and exterior colors and materials derived from the four seasons of the wetland, and from the sandhill cranes that nest on the property, the house sustains an appropriate and reciprocal relationship to its place.